A major benefit is the elimination of broken machine tool setups, says the user. With the help of a portable digitized dimensional inspection system from Romer and Delcam, Concepts NREC is transforming the way turbomachinery is designed, prototyped, and tested. 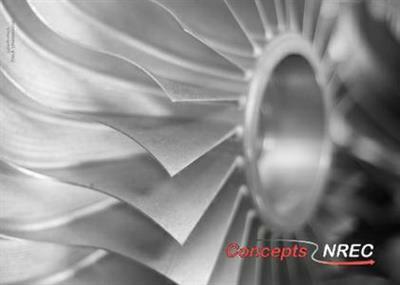 Concepts NREC, a major developer of these key industrial components, is revitalizing its Woburn, Mass., operations to handle more demanding turbine designs, and more of them, in less time and with higher quality inspection data. The new dimensional inspection system is a portable coordinate measuring machine (CMM), consisting of a seven-axis Infinite™ Arm from Romer (Wixom, Mich.), and PowerINSPECT from Delcam (Salt Lake City, Utah). Romer is a unit of Hexagon AB in Nacka Strand, Sweden. The CMM, a key part of the 55-year-old company's efforts to revitalize its operations, is dedicated to shop floor operations and replaces—in many cases—gauges, Vernier scales, calipers, and micrometers. Because turbine wheels demand precision beyond the capability of any portable, the company also uses a Zeiss CMM isolated in a vibration-free room that is temperature- and humidity-controlled. The Woburn plant, the Concepts NREC Product Center, also purchased a new five-axis Hermle machining center and is planning to add an additional 5-axis machine in 2007. Revitalization also embraces tooling, machining processes, continuous-improvement methods, plus Lean Manufacturing to minimize inventories. Purchased in June 2006, the portable CMM immediately paid for itself by avoiding production errors that would have led to scrapping a pair of integrally cast and machined turbine "wheels" worth $30,000 apiece. On its second job, the portable cut two weeks out of the usual 10-week development cycle, allowing Concepts NREC to better meet the delivery schedule for a customer hard-pressed for time. "Inspections with the portable are very quick, very accurate, and very cost-effective," said Jeff Pfeiffer, director of business development - products and services at Woburn. "But the really big gain is not having to break setups on machine tools every time we need inspection data." "When a machining setup is broken, dozens of carefully calculated dimensional relationships among fixture, workpiece, and machine tool speeds, feeds, and cutter offsets are severed," explained Marty Heald, shop manager at the Product Center. "Re-establishing them after an inspection takes more effort than the original setup." The portable CMM has slashed inspection time to hours from weeks; slashed inspection setup time to minutes from hours; and generated far more data with three to five times greater accuracy. It has also vastly increased the variety of in-process measurements and built much greater confidence in the data since complete machining setups and fixtures can now be measured. Overall benefits to the company include a significant boost to its core turbine wheel business-design, development, simulation, and physical testing—with fully digital in-process inspection data. Totaling 45,000 square feet, the Product Center is divided about evenly between Heald's temperature-controlled machine shop, assembly cells, and balancing and testing. Concepts NREC employs 45 in Woburn; total company employment is 125. The firm's products range from three-foot-diameter alloy steel "wheels" for power generation turbines to tiny ceramic devices less than two inches in diameter that run at 100,000 rpm or more. Turbomachinery is found throughout power generation, gas separation, axial and centrifugal pumps and compressors, fuel cells, turbochargers, and on-board power systems for airliners. Turbine wheels are used as compressor stages, impellers, rotors, stators, inducers, diffusers, propellers, and even seals. Worldwide, dozens of companies produce them and many rely on Concepts NREC for new designs. These "wheels" are disks or hubs with four to 30 airfoil blades around their perimeters. They are machined from bar stock or forged metal disks. So that the wheel balances perfectly, every blade must be identical and those blades have complicated, twisting three-dimensional shapes. In cross-section, the individual blade looks like an extended, curved teardrop; hence, the need for five-axis machining and inspection. Concepts NREC uses its own custom five-axis CAM software, MAX-PAC™, to program the machining of these parts. PROBLEM: "We Didn't Know What We Had"
"We were missing an opportunity with the old inspection methods that we could have offered customers more detailed and more comprehensive data," said Heald. "Our machining was excellent and carefully validated, but the old methods did not always make that clear." Lack of good data also meant time was wasted while scrap and rework could push costs up. Disruptions to machining setups aside, the prior methods took more time, were less flexible, and were labor-intensive and thus more costly. "Inspection generally takes 10% to 30% of the time needed to machine a job," said Pfeiffer. "Inspecting a complete wheel manually took anywhere from a few days to, in extreme cases, weeks," Heald said. "One profile on one blade often took eight hours and a complete blade inspection requires six profiles, three on each side. That meant we might spend as much or more time inspecting something as we did on machining it. "The prior methods were also limited in what they could measure efficiently," he added. "Blades are freeform shapes, and a constant inspection challenge was establishing good points of reference and baselines to measure from. The manual inspection methods were very often bottlenecks," Heald said. The Romer arm, mounted on a mobile granite table that can be clamped right to the machine tool, has measuring accuracy of 0.0011-inch, "worst case, with the arm extended to its full six-foot reach," said Heald. "When we probe a surface close to the arm's base, accuracy is far higher." "We are steadily removing process deviation from our manufacturing methods," he pointed out. "We gather all the in-process dimensional data we can, and we put it to work as soon as possible—especially data from machining setups and fixtures. We never had enough data on those kinds of deviations before." The portable CMM system at the Woburn plant was developed jointly by Romer and Delcam. The Romer Infinite Arm is an accurate, portable, freeform measurement system that has wireless communications, eliminating cable tangles, and built-in digital cameras that capture setups. The rigid, lightweight, carbon-fiber arm is counterbalanced for one-hand use and can be mounted anywhere, in almost any orientation. Delcam's PowerINSPECT software organizes and processes hundreds of touch-probed points in real time and matches each point with its corresponding location in the wheel's or blade's CAD file. Data on whether a point is in or out of specification, and by how much, is almost instantaneously available. "One of the most useful features of PowerINSPECT is its ability to quickly align a CAD model with the actual part in 3D space," said Heald. "This allows the part to be inspected anywhere, in any orientation. After the operator takes an initial measurement from the part using the ROMER arm, the software compares it to the model, and then aligns them so deviations from the original 'as-designed' surface data can be measured." Managers pointed out that the 7-axis flexibility of the Romer Arm lets operators easily orient the probe to measure hard-to-reach surfaces of the blade, especially on shrouded blades. While Concepts NREC's previous manual inspection methods generated good numbers, the new fully digital methods very quickly gather several times more numbers, and they do so with far less disruption of machining operations. The blades of turbine wheels require dozens of different exacting and exhaustive inspections with the Romer and PowerINSPECT. These include "streamline" measurements, which are lines of 120 closely spaced, touch-probed points; profiles across blade leading edges; blade thicknesses in various sections and trailing edges; blade curvatures, cross-sections and twists on both sides; and relative locations of blades to each other and to their hubs. "A complete blade measurement requires nearly a thousand touch-probed points," Heald said. "Today, all this takes about four hours. For most of these measurements previously, we had to take single sets of data, make single measurements on our CMM, and manually plot them against the model in a CAD package. It took a complete workday just to gather the data and many more hours to manually plot and inspect the points against the model. Now with the Romer Arm and PowerINSPECT, the complete process takes about four hours. "The decision to buy the portable CMM was triggered by demands from a longtime customer for blade and shroud surface data that could not otherwise be provided," Heald continued. "With PowerINSPECT, we can set up inspections whatever way the customer or the blade designer deems best. And we can do it in minutes now instead of hours." Less obvious but farther reaching is that Concepts NREC "is able to detect problems before they occur," Heald said. "That saves the customers and ourselves a lot of grief. We can make quick checks during and after rough-machining to see where the surfaces actually are, before we machine any further," he continued. "This is very important since many turbine wheels take three weeks to fully machine. We could not do that before without taking the blade out and breaking the setup." The portable CMM "has really increased our confidence in the accuracy of our machining," Heald added. "That lets us engineer much better machining processes." Overall, inspection times average three to five times faster with the portable CMM and those gains go right to delivery time. For more information on Concepts NREC, visit www.conceptsNREC.com. For more information on Romer, visit www.romer.com. For more information on Delcam, visit www.delcam.com.